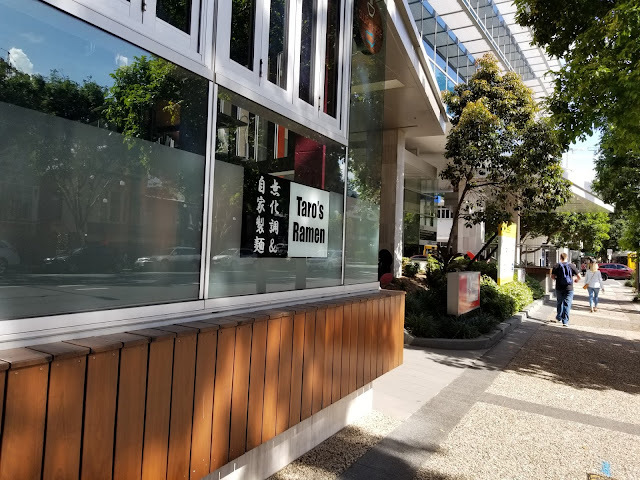 Having gone to two ramen places recently, there is no doubt that next on my hit list would be the newest and largest Taros Ramen, which has opened on Melbourne Street in South Brisbane. Having just finished (and beat) a locked room game with a few good friends of mine, one of them mentioned that he had never been to any of the Taros stores before! 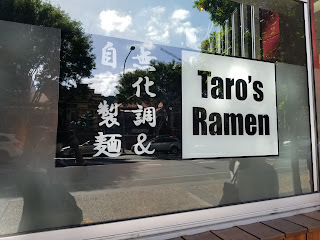 I knew that I had to rectify the situation then and there, so I made the group trek all the way across from the city over to West End to get more hot soupy ramen, because honestly, who can get ever get enough ramen? Arriving on a Saturday lunchtime, I was surprised at how empty it was. I did like the wooden booth seats though, which were cosy enough for our group of four. 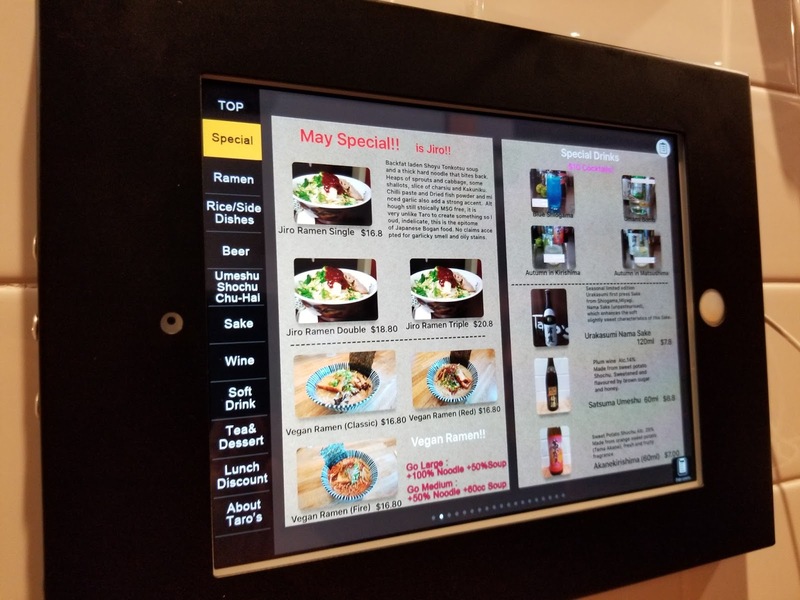 Like the ascot store, we got to order via ipad rather than having to line up, which is always a relief. I liked how customiseable the ramen was, given a huge selection of alterations and additions, and we all took considerable time to put in our order. 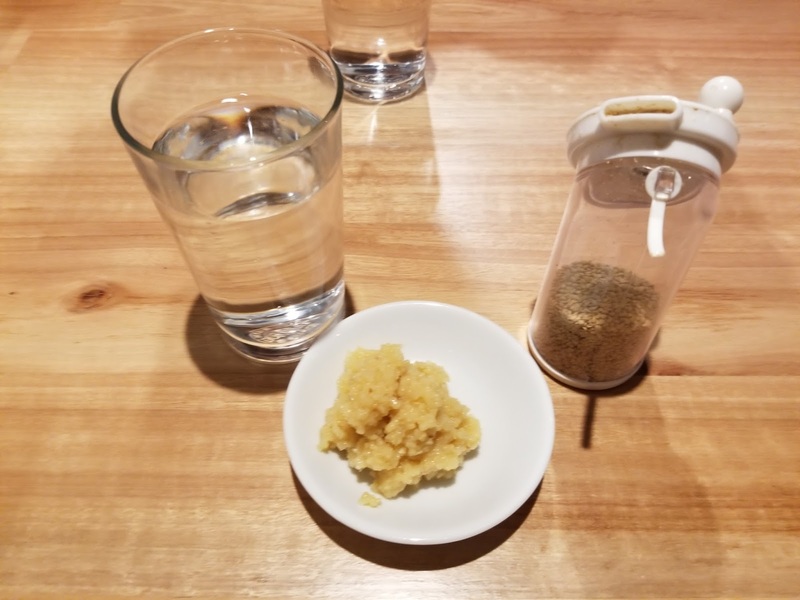 After my disappointment at being charged for condiments at Genkotsu, I was super relieved and pleased to see the condiment table at Taros. So of course I loaded myself up on garlic. Behold my small mountain of garlic! Drinks arrived first, I liked how there was both local drinks in addition to foreign drinks. 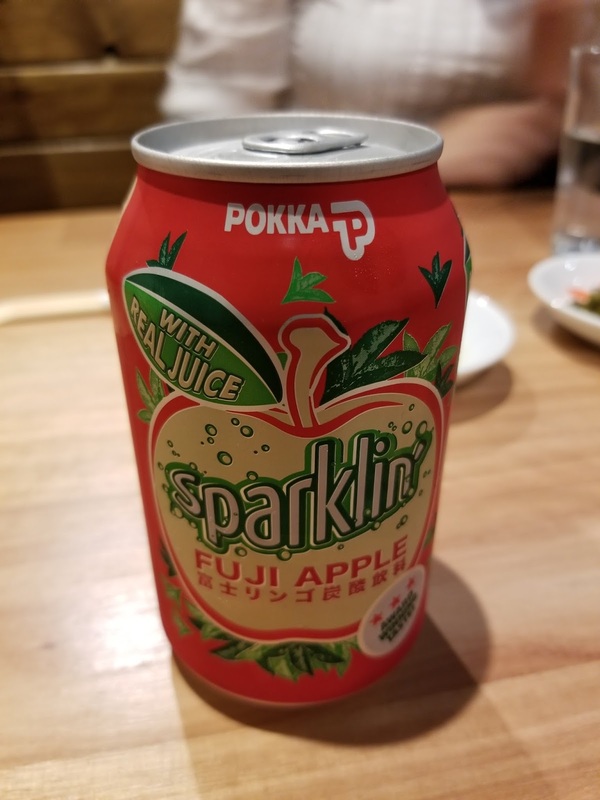 The sparkling fuji apple soda was fruity and delicious without being overly sweet. 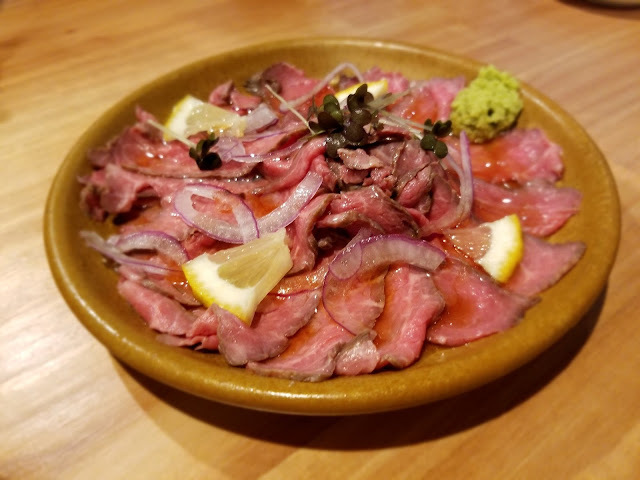 To start, we had a shared plate of wagyu beef with citrus ponzu. 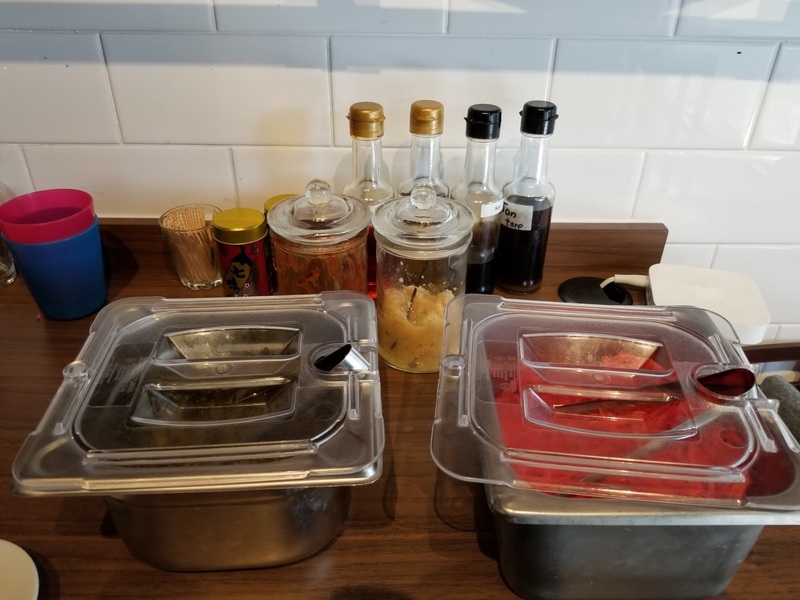 As you can see, the wagyu was wonderfully well marbled, but as it was served cold we really weren't able to enjoy the melt in your mouth sensation that can only be found in heated beef. 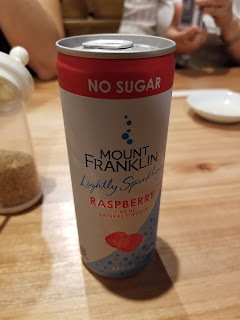 Having said that, the meat texture was delightfully tender and coupled with the zing of citrus, made for a refreshing and light appetizer for our forthcoming meal. One friend, who I shall now dub the Rice Queen, can rarely have a meal without rice, so despite the fact that we were at a renown ramen store, she still settled on a dish of karage chicken with a side of rice. 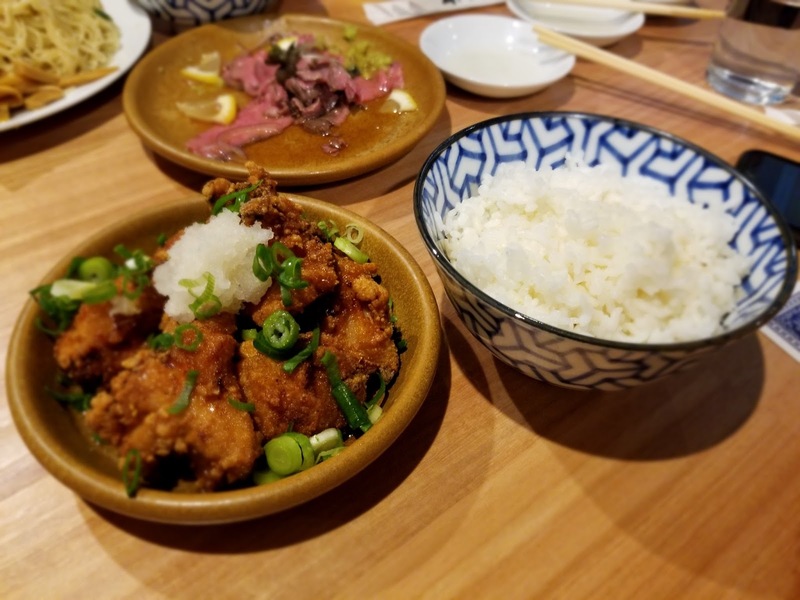 I'm not one to order rice at a noodle store, but it cannot be denied that the rice was tender with a smooth texture, and the chicken was freshly fried with a thin but crunchy and crispy exterior. 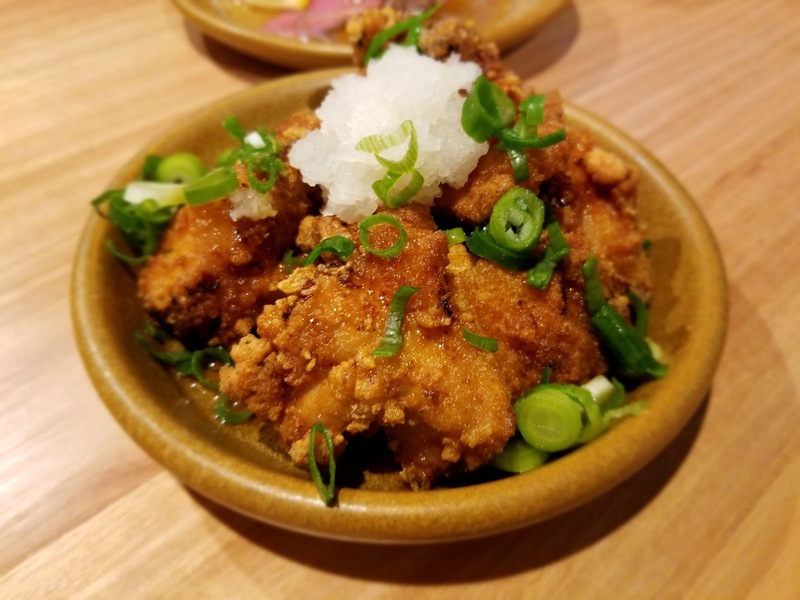 Coupled with the grated radish and garnish of spring onions, this really separated it out from the standard karage chicken that you could get at any other Japanese restaurants. 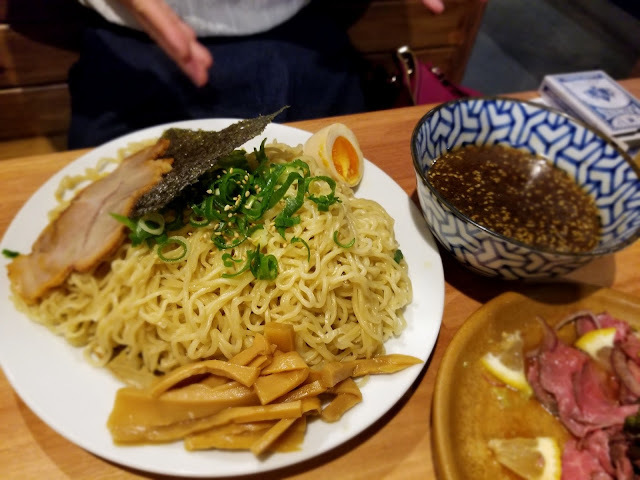 Wanting something out of the ordinary, Queen V opted for the Tsukemen with double portion of noodles. 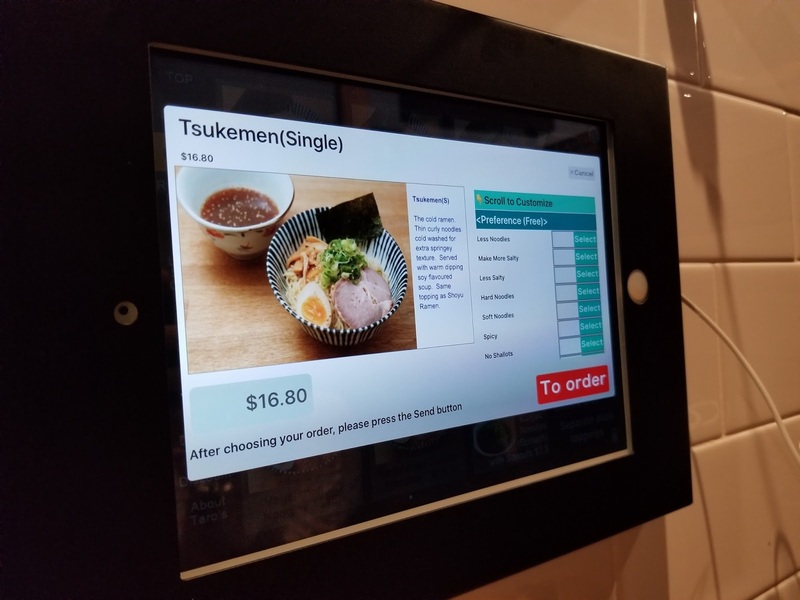 For those who are unaware, Tsukemen ramen consists of dry cold noodles served with toppings to a side, with a bowl of hot soup that is particularly concentrated and serves as a dipping sauce for the noodles before they are consumed. 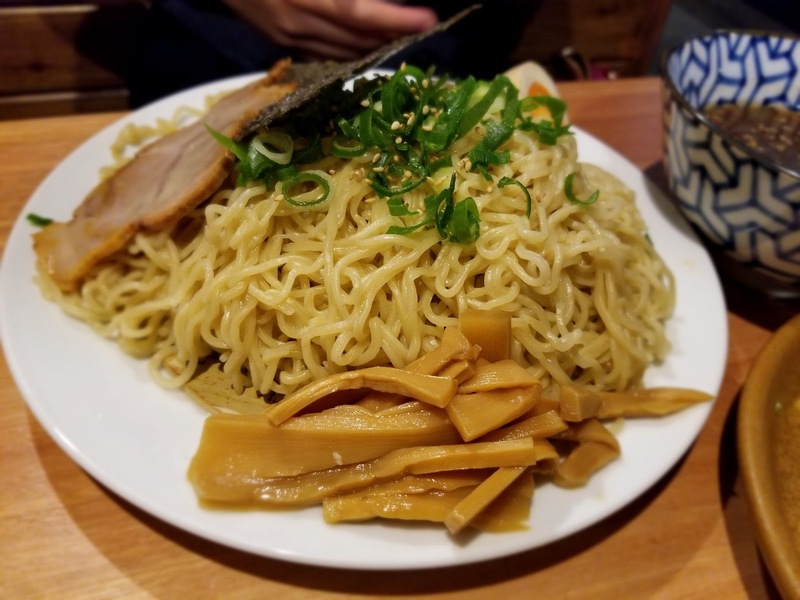 As you can see, the double portion of noodles was huge, and Queen V was definitely unable to finish it all. Compared to the straight white wheat noodles we had, she had curly egg noodles, which I love for the egg fragrance. She said the soup was also wonderful and strong in sesame taste. 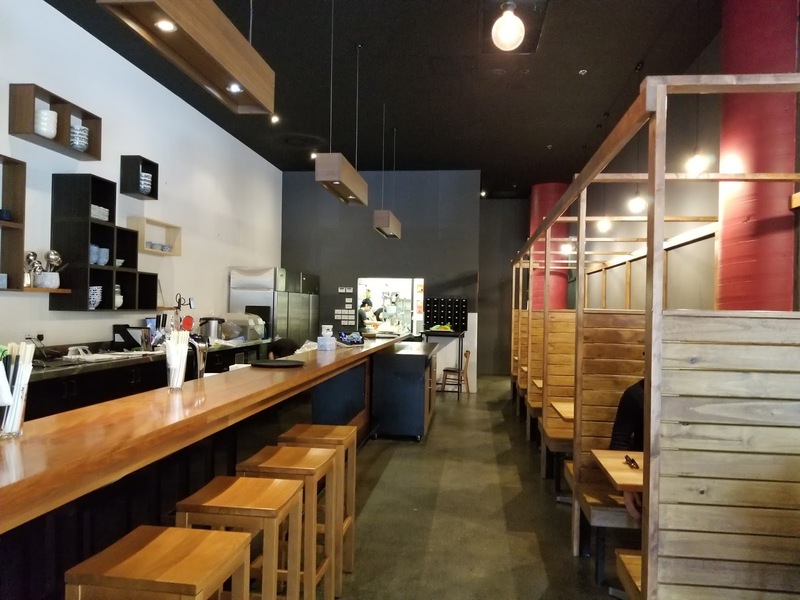 As an experiment of sorts, my final companion ordered a black garlic ramen with kaedama, whereas I ordered an extra large bowl of black garlic ramen. I feel I got the larger serve. 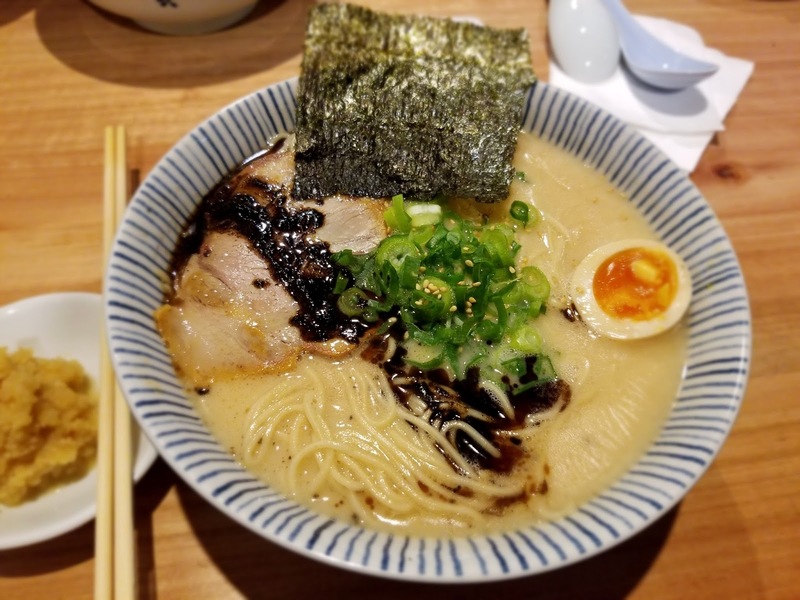 I found my black garlic ramen to be wonderfully nourishing with a thick gelatinous porky soup that had an intricate depth of flavour. 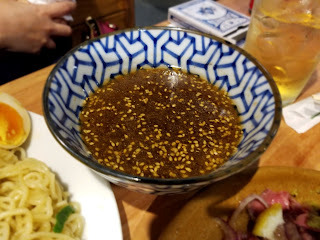 The smoky garlic was fragrant and delightful, and the noodles definitely had considerable bite to it. The only suggestions I'd make is that the pork was a bit too fatty and the egg erred on the side of being overdone slightly. 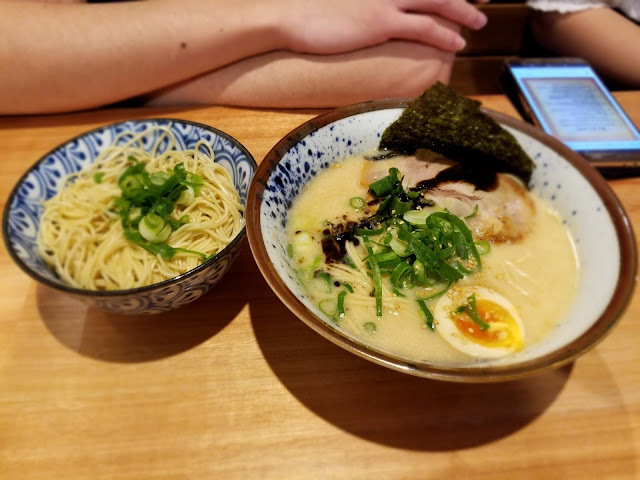 Other than that, it was definitely a great bowl, and I can't wait to be back in July for Truffle Ramen!